On Friday 9 May, 2014, along with London Metropolitan Archives (LMA), we are holding a study day conference, Educating Londoners: Sharing Experiences in the Archives, taking place at LMA. Join us for a day of talks, recollections and document viewing to explore the stories of Londoners and their education. 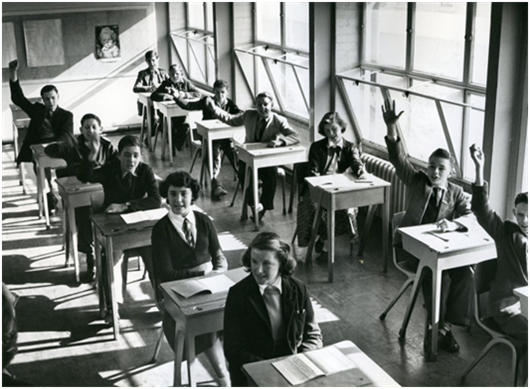 LMA partners with the Archives at the University of London’s Institute of Education to inspire discussion and reflection on education in London in the 20th century. 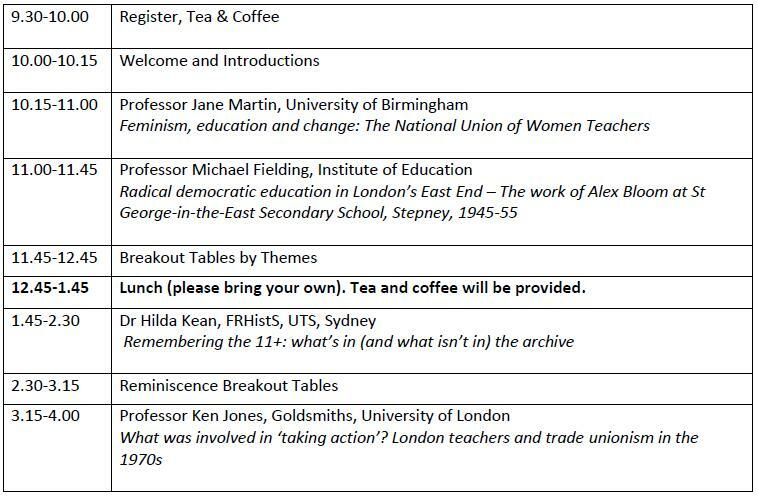 From school architecture to school yard play, teacher unionism to after school detention, school dinners to curriculum reform, this day’s timetable can cover it all. Places can be reserved here, free of charge. Professor Jane Martin (University of Birmingham) is the School of Education’s Deputy Head with responsibility for Strategic Development and Head of Department of Education and Social Justice. She moved to Birmingham from the Institute of Education, University of London, where she was Head of Department of Humanities and Social Sciences. She has lectured in Education Studies, History, Sociology and Women’s Studies. Her publications include Women and the Politics of Schooling in Victorian and Edwardian England, winner of the History of Education Society (UK) Book Prize 2002 and Making Socialists: Mary Bridges Adams and the Fight for Knowledge and Power 1855-1939 (2010). Her books with Joyce Goodman include Women and Education 1800-1980 (2004) and a 4-volume set for Routledge Women and Education: Major Themes in Education (2011). She is a past editor of the journal History of Education, past president of the UK History of Education Society and was the Brian Simon BERA Educational Research Fellow for 2004/5. She is a member of the Education Sub-panel for the 2014 Research Excellence Framework (REF) on behalf of the UK Higher Education Funding Councils and the holder of a British Academy / Leverhulme Small Grant: Caroline DeCamp Benn: A Comprehensive Life, 1926-2000. Professor Michael Fielding: Currently Emeritus Professor of Education at the Institute of Education, University of London and Visiting Professor of Education at the University of Bristol, Michael Fielding taught for 19 years in some of the UK’s pioneer radical secondary comprehensive schools and for a similar period and with identical commitments at the universities of Cambridge, London and Sussex. Widely published in the fields of student voice, educational leadership and radical democratic education, his latest book, co-authored with Peter Moss, Radical Education and the Common School – a democratic alternative (Routledge 2011) seeks to reclaim education as a democratic project and a community responsibility and school as a public space of encounter for all citizens. He has recently received a grant from the Leverhulme Foundation to continue his research on the life and work of Alex Bloom, from 1945-55 headteacher of St George-in-the East, Stepney, one of the most radical democratic secondary schools England has ever seen. Professor Ken Jones has been Professor of Education at Goldsmiths since 2010, having previously worked in London secondary schools, at the Institute of Education, and at Keele University. As a teacher, he was secretary of the Barking & Dagenham Association of the NUT and for 8 years a member of the union’s national executive. As an academic, the main area of his current interest is education policy, and the conflicts around it. He writes about the economic and social crisis through which Britain, and other countries in Europe, have been living since the financial crash of 2008. He analyses the education policies developed by governments in this period, and the ways in which these policies are critiqued and challenged by those who do not share current policy orthodoxies. Some of his articles are about the ideas and practices developed in the radical education of the twentieth century; others look at more recent alternatives. His two latest, edited, books are ‘Education in Europe: the politics of austerity’ (free to download at http://radicaledbks.files.wordpress.com/2013/09/education-in-europe.pdf) and, with Catherine Burke ‘Education, Childhood and Anarchism; talking Colin Ward’. We hope to see you there! If you’d like any further details, please contact me at alexandra.hall@ioe.ac.uk. If you happened to have stumbled upon this page, I highly suspect you have an interest in either women’s history, archives, education, activism, or perhaps all of the above. If this is the case (… I sincerely hope this is the case, or you’ll likely find this site pretty disappointing…), this is just a quick post to direct you toward our events page, as we have several workshops and open days on offer in the next couple of months. While we are still offering school workshops, we’re also focusing on adult learning opportunities… so take a look, and see if there’s anything of interest. We’re looking forward to engaging with new audiences, so we hope to see some of your faces! The International Women’s Day Conference at London Metropolitan Archives, Sisters are Doing it for Themselves: 7 March 2014. Annual Study Day at the Institute of Education’s Newsam Library & Archives on 25 March 2014. This year’s theme is “Anthem for doomed youth”? Exploring conflict & resolution through archives. In conjunction with London Metropolitan Archives, we’ll be holding an Open Day at LMA on 9 May 2014, with speakers, document viewing, and discussion groups. The theme of the day is Educating Londoners: Sharing Experiences in the Archives. This practical session will introduce the background to the British Library Campaign! Make an Impact project, present case studies for discussion and engage delegates in a range of activities which can be used in delivering successful partnership projects between schools, museums, libraries, archives and galleries. Find out about new work planned at the Institute of Education Archives, specifically around the archive of the NUWT (National Union of Women Teachers). There will also be a presentation from teacher David Rosenberg about his work at LMA on material relating to the Anti-Apartheid movement and developing this for schools. Other discussions will focus on working with LGBT archive materials and new ideas at Guildhall Art Gallery centered upon exhibitions of John Bartlett (painter of the Poll Tax Riots) and Ajamu of rukus! Federation who will be exhibiting a photographic portrait exhibition of black LGBT people in 2013. Please bring project news to share and your diaries to fix dates for the next London Network Skills Exchange and Networking Group.